Finding the right place to have your car serviced can be frustrating. 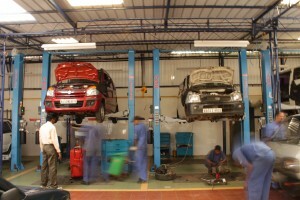 You want them to take good care of your vehicle while paying them a reasonable rate. Plus you want them to be located close to home. So how do you find the service center that’s right for you? Quality is important to all of us, especially when dealing with our cars, but we also have to balance that against cost. Specialized services are important too. If you need transmission work, you really need an expert, whereas basic maintenance and oil changes require less finesse. After you have some idea of what you’re looking for, the best place to begin looking may not be the Internet. Think about your friends have recently had some work done and ask them first. Once you have a few names, then research online. If they have a web presence, either a website or Facebook, that is a plus because you can get a good idea from there about the types of services they offer, their location, and contact information. When you are ready to bring your car in, give them a call or contact them via e-mail. They should be willing to answer your questions and treat you with good customer service. After all, if they treat you poorly, what makes you think they’ll treat your car any differently? With these suggestions, you should be able to find a service center that can give you what your car needs for a reasonable price.